Alana Lentin. 2018. ‘Race/ in W. Outhwaite and S. Turner (eds. ), William Outhwaite amd Stephen Turner (eds). The Sage Handbook of Political Sociology. Alana Lentin. 2015.’What Does race Do?’, Ethnic and Racial Studies. 38(8): 1401–1406. Alana Lentin. 2008. Chapter 1. Racism, A Beginner’s Guide. Oxford; Oneworld. Jose Munoz. 2006. ‘Feeling Brown, Feeling Down: Latina Affect, the Performativity of Race, and the Depressive Position’, Signs 31(3): 675-688. Clarence C. Gravlee, 2009. ‘How Race Becomes Biology: Embodiment ofSocial Inequality,American Journal of Physical Anthropology: 139:47–57. Introduction and Chapter 1, ‘Race-the Sliding Signifier’ of Stuart Hall. 2017. The Fateful Triangle: Race, Ethnicity, Nation. Harvard: Harvard UP. Appiah, Anthony. 1985. ‘The Uncompleted Argument: Du Bois and the Illusion of Race,’ Critical Inquiry 12(1): 21-37. Alana Lentin. 2008. Chapter 2, Racism, A Beginner’s Guide. Oxford: OneWorld. W.E.B. Du Bois. 1940. Dusk of Dawn. An Essay Toward an Autobiography of a Race Concept. Oxford: Oxford UP. Les Back and Maggie Tate. 2014. ‘Telling About Racism: W.E.B. Du Bois, Stuart Hall and Sociology’s Reconstruction,’ in Alana Lentin and Wulf D. Hund (eds). 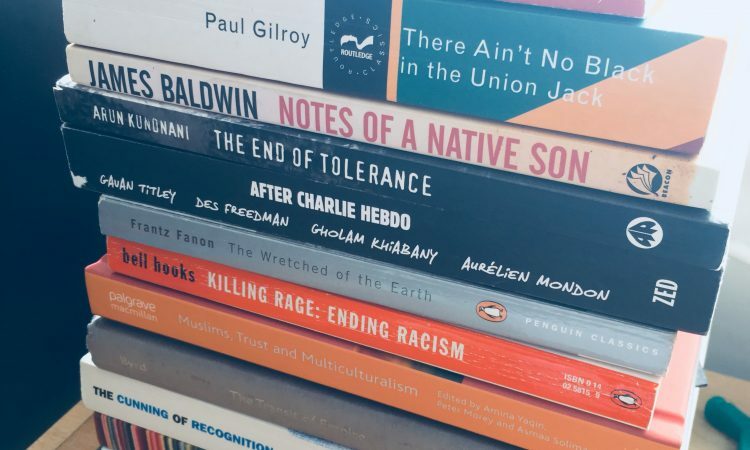 Racism and Sociology. Berlin: Lit Verlag. Chapter 2 – ‘Ethnicity and Difference in Global Times’, in Stuart Hall, The Fateful Triangle. Harvard: Harvard UP. Glenn Coulthard. 2014. Chapter 1, ‘The Politics of Recognition in Colonial Contexts,’ Red Skin, White Masks: Rejecting the Colonial Politics of Recognition. University of Minnesota Press. Alana Lentin. ‘Replacing ‘race’, historicizing ‘culture’ in multiculturalism’, Patterns of Prejudice 39(4): 379-396. Etienne Balibar. 1991. ‘Is There a Neoracism?’ Race, Nation, Class: Ambiguous Identities. London: Verso. Robert J.C. Young. 1004. Colonial Desire: Hybridity in Theory, Culture and Race. London: Routledge. Linda Tuhiwai Smith. 2012. ‘Chapter 10: Towards Developing Indigenous Methodologies: Kaupapa Maori Research’, in Decolonizing Methodologies (2nd ed.). London: Zed Books. Patricia Hill Collins. 2015. ‘No guarantees: Symposium on Black Feminist Thought’, Ethnic and Racial Studies, Vol. 38, No. 13, 2349–2354. Eduardo Bonilla-Silva and Tukufu Zuberi. 2008. ‘Introduction: Towards a Definition of White Logic and White Methods’, in White Logic, White Methods. London: Rowman and Littlefield. Aileen Moreton-Robinson. 2015. Introduction to Critical Indigenous Studies: Engagements in First World Locations. University of Arizona Press. David T. Goldberg. 2015. ‘Racial Comparisons, Relational racisms: Some thoughts on method’, in Karim Murji and John Solomos (eds. ), Theories of Race and Ethnicity: Contemporary Debates and Perspectives. Cambridge: Cambridge University Press: 251-262. Nelson Maldonado-Torres. 2010. ‘The time and space of race: reflections on David Theo Goldberg’s interrelational and comparative methodology’, Patterns of Prejudice, Vol. 44, No. 1. Symposium on ‘Patricia Hill Collins Black Feminist Thought’, Ethnic and Racial Studies 38(13), 2015. Alana Lentin. 2014. ‘Postracial Silences: The Othering of Race in Europe’, in Wulf D. Hund and Alana Lentin, Racism and Sociology. Berlin: Lit Verlag. Brenna Bhandar. 2018. Introduction to Colonial Lives of Property: Law, Land and Racial Regimes of Ownership. Durham, North Carolina: Duke University Press. Cheryl Harris. 1993. ‘Whiteness as Property‘ Harvard Law Review 106(8): 1707-1791. Aileen Moreton-Robinson. 2015. ‘Bodies that Matter on the Beach’, in The White Possessive: Property, Power, and Indigenous Sovereignty. University of Minnesota Press. Patrick Wolfe. 2016. Introduction and Chapter 1 of Traces of History. London: Verso. Irene Watson. 2002. ‘Buried Alive,’ Law and Critique 13: 253–269, 2002. K-Sue Park. 2016. ‘Money, Mortgages, and the Conquest of America,’ Law & Social Inquiry. Sara R. Farris. 2017. In the Name of Women’s Rights: The Rise of Femonationalism. Durham: Duke UP. Saba Mahmood. 2005. Politics of Piety. Princeton University Press. Éric Fassin. 2010. ‘National Identities and Transnational Intimacies: Sexual Democracy and the Politics of Immigration in Europe,’ Public Culture 22:3. Nadia Fadil. 2011. ‘not-/unveiling as an ethical practice,’ Feminist Review. Volume 98, Issue 1, pp 83–109. Safiya Noble. 2017. Algorithms of Oppression: How Search Engines Reinforce Racism. New York: NYU Press. Syed Mustafa Ali. 2016. ‘A Brief Introduction to Decolonial Computing,’ XRDS VOL.22 • NO.4. Ali Breland. 2017. ‘How white engineers built racist code – and why it’s dangerous for black people,’ The Guardian. Jessie Daniels. 2015. “My Brain Database Doesn’t See Skin Color”: Color-Blind Racism in the Technology Industry and in Theorizing the Web,’ American Behavioral Scientist Vol. 59(11) 1377–1393. Les Back. 2002. ‘Aryans Reading Adorno: Cyber Culture and Twenty-First Century racism,’ Ethnic and Racial Studies, 25:4, 628-651. Tressie McMillan Cottom. 2017. ‘Black cyberfeminism: Ways forward for intersectionality and digital sociology,’ in J. Daniels, K. Gregory and T. McMillan Cottom (eds. ), Digital Sociologies. Apryl Williams. 2017. ‘On Thursdays we watch Scandal: Communal viewing and Black Twitter,’ in J. Daniels, K. Gregory and T. McMillan Cottom (eds. ), Digital Sociologies. Sanjay Sharma and Phillip Brooker. 2017. ‘#notracist: Exploring racism denial talk on Twitter,’ in J. Daniels, K. Gregory and T. McMillan Cottom (eds. ), Digital Sociologies. Lisa Nakamura and Peter A. Chow-White. 2012. Race After the Internet. London: Routledge. Alana Lentin and Justine Humphry. 2016. ‘Antiracism apps: framing understandings and approaches to antiracism education and intervention,’ Information, Communication & Society.